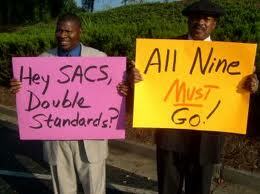 SACS Army Withdraws From Clayton County! | Georgia Teachers Speak Out! ← Two Days of Commenting on Clayton’s Edmond Heatley…& Tidbits of Other Matters! SACS Army Withdraws From Clayton County! MACE Points Out Mark Elgart’s Hypocrisy In DeKalb! I don’t think that the SACS (Russian) Army will march back into Clayco (Afghanistan) any time soon. The Russians marched boldly into Afghanistan in 1979…but whimpered out in 1988, all beaten, bruised, and maimed. Mark Elgart and his SACS Army boldly marched into Clayco with its pitiable pronouncement of a report on February 15, 2008 — a report that then board member Norreese Haynes called “a sham and a farce.” SACS leaves today, May 13, 2011 — yes, Friday the 13th — quietly and with hardly a whimper. Since that fateful day on February 15, 2009, we have seen Mark Elgart, the once feared Emperor of Accreditation, reduced to a laughing stock and a caricature. This emperor is indeed naked. Exposed. SACS is a money-grabbing private organization with no accountability to the People of Georgia. The SACS Board of Directors probably told General Elgart to immediately bring the SACS troops from Claytonistan. For SACS, at best, it was a pyrrhic victory; at worst, it was an over-extension of Mark Elgart’s Alexander-the-Great-Ego-Tripping which thinly stretched SACS’s supply lines, with the SACS veneer being sullied with Clayco mud. I see images in my mind of Mark Elgart whisking his aide-de-camps to the hovering helicopters on top of the Clayton Central Office on Jonesboro’s Fifth Avenue so that they can get the heck out of the jungles of Clatyonam. I can’t resist using these metaphors, and I certainly mean no offense to the great men of valor who proudly wear our uniforms and defend us. Norreese Haynes was right from the very beginning. He sent his press release out on the very day (with the hour) of Elgart’s released report on Clayton County — that laughable report. Please read it. Like the Atlanta SACS Report, it was pitifully written. Had no substance. Made erroneous allegations. Within a few months, all of Clayton’s nine board members had resigned in humiliation or had been forced off the school board, including GAE members Ericka Davis and Rod Johnson, the Chair and Vice Chair who foolishly called upon Mark Elgart’s assistance. It appears that Norreese Haynes was exposing too many improprieties on the school board (the now infamous Land Deal, the lawyer’s two contracts-switheroo, the egregious micro-managing of the school systems by board members Davis and Johnson, etc.). They needed help. They apparently enlisted Eldrin Bell to help, and they all went a’ callin’ on ole Markie Elgart. Elgart must have thought…”Piece of cake. No problem.” Now that SACS has been thoroughly exposed, I wonder if Elgart’s thinking the same thing now. Just a thought.